Recycling cans couldn’t get much quirkier or more lovable than these PACMAN containers that gobble-up garbage like their computerized namesake. 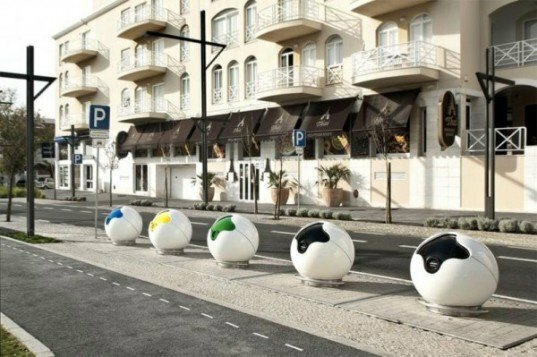 Designed by Portuguese studio AND-RÉ, the cans are simple round items of urban furniture that help residents of Vilamoura separate out their trash. Each one is identified with a mouth in a starkly different color – blue, yellow, black or green – which makes recycling even easier than before. The design is comprised of a stainless steel frame on which the large balls stand, while a central knob to open the can is placed in the middle of the mouth for better accessibility. And in case the colors aren’t clear enough, each recycling can comes with a nifty label to tell you what trash goes where. The winner of this year’s Iberian Urban Equipment Prize – Larus/Architectures, the PACMAN designs help to make recycling more appealing than ever. 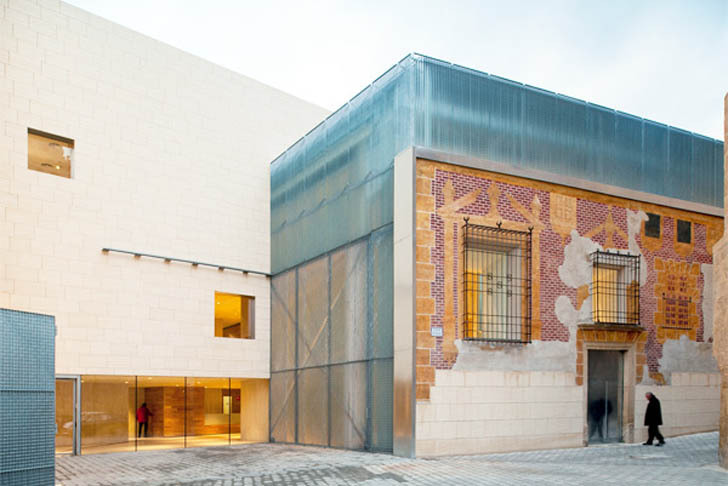 Skillfully mixing the old and the new, Madrid-based Exit Architects gave an historical museum in Albacete, Spain a delightful green upgrade. The Holy Week Museum of Hellin -- Museo de Semana Santa de Hellín -- has been expanded to fit more art while respecting the original facade decorated with original paintings. This museum in the southern town of Hellín stands out from its ruins with its clashing aesthetic and historical religious values. Two of the original museum's sides have been kept standing, while the new extension includes a restored version of the Casa del Conde. Meassuring 23,200 square foot, the main contemporary materials used in the transformation are concrete and u-glass. The U-profile glass, widely used on walls, lets natural light in, is insulating and last a long time. Instead of shiny white plints, Exit Architects custom-made long and lean wooden exhibitors to hold and shelter the art pieces. The original museum volume was destroyed in search of natural light and now it has lots of open-air balconies with amazing views into the old town. A contrasting balance between the old and the new, The Holy Week Museum managed to incorporate innovative materials to a long-lasting design.